Blender seems to improperly EXPORT BVH. 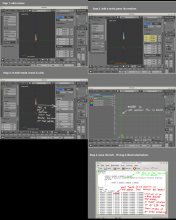 Attached is .zip a round trip import-export pair of files that demonstrate that Blender does not return the same file it imports. The image shows the improper consequence of import/export round trip in Blender. Refer to equation 3.2 on page 8 and the description next to it. "Therefore,Tx,Ty and Tz represent the summation of abone’s base position and frame translation data." "The rot filesation data comes from the motion section. For the root object, the translation data will be the sum of the offset data and the translation data from the motion section"
Rob Baer (rwbaer) raised the priority of this task from to Normal. Rob Baer (rwbaer) set Type to Bug. Rob Baer (rwbaer) added a subscriber: Rob Baer (rwbaer). Code seems to be doing what's expected here...(re movement and all). The issue I was seeing, is that BVH export copied the offset of the root joint in the X/Y/Zposition channels of the MOTION, even if the animation track in blender had no translation on that bone, only rotations. Create a new armature in Blender, add one bone, place this bone's head at a different position than the origin. Apply a pose to this armature containing only rotations, no translations. Export to BVH. When observing the BVH file, the root joint will contain translation channels, and they will be non-zero. In fact they will contain the same coordinates as the offset of the root joint. This is contradictory to the literature pointed to by Rob. It also seems to contradict a variety of existing BVH implementations, for example BVHacker.